Ye Olde English Cuisine runs hot! Last week's recipe seems to have hit the right the spot with many ex-pats out there, with emails received asking for similar dishes. This week's recipe see us taking another trip down memory lane with an old favourite and traditional dish: steak and kidney pudding. It was prompted by an email request by Lisa H. of Cypress, California, USA. Who married to a New Zealander in February of this year . . . congratulations to the newly weds! Lisa requested a recipe for a traditional 'Kiwi' meat pie, which I emailed her personally (see what can happen when you ask! ) But it got me thinking, maybe her new husband would also like another taste of home. I was also contacted by the editor of a popular international magazine for information on steaming puddings, so it seems apt to combine the two. I think to a degree, that this is a problem with many modern day professional chefs; they are so tuned into creating high-faluting dishes which combine any and every weird ingredient they can find into one dish, many seem to have forgotten about the classics. Forgotten that there are dishes out there, that have passed the test of time and should / will never die. So to all the my fellow professionals chefs out there . . . come on guys; remember cuisine is not about fashion, it is about cooking! Now if you really want to get traditional, try 'Pickwick pudding'. This is the same as steak and kidney but with the addition of oysters. This dish derives its name from the Charles Dickens classic novel 'The Pickwick Papers', in which the dish first featured. If you want to keep the traditional theme going; serve it with some fluffy mashed potato, marrowfat peas and some extra rich meat gravy. Wow ! This dish requires the making of a suet paste which can be found at HUB-UK by clicking on this link. This can be used for making many 'old fashioned' sweet and savoury puddings or dumplings. Care must be taken when removing from steamer and removing the covers; to ensure no scalds occur. 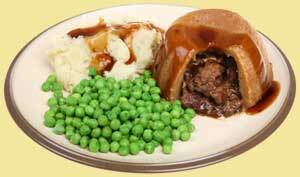 Enjoy your Steak and Kidney Pudding and bon appetit . . . . .